If you have been down Laurier Avenue in the last few days you may have noticed these "launch pads". These pads will facilitate the turns of cyclists from the Laurier segregated lanes. 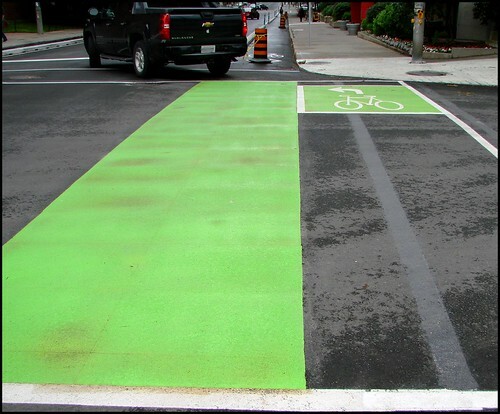 According to the City of Ottawa, "To enable safe left turns for cyclists using the pilot facility, bike “launch pads” have been proposed at intersections in front of automobile traffic and pedestrian crosswalks. These launch pads would enable cyclists to safely perform a two-stage left turn: the cyclists would cross the intersection in the designated cycling lane, then would wait on the launch pad for the traffic signal to switch to allow movement on the cross street. Originally these were going to be blue but green works for me too. This one is at Laurier and Bay but there will likely be more in the next few days. On inspection, they appear to be made of a skid resistant material that should last a good while. I am looking forward to sitting in my launch pad!